In addition to shading, correct and adequate ventilation is imperative, so that a conservatory or a building with glass facade does not become a greenhouse. At its simplest, ventilation takes place via windows and roof vents. But this “natural ventilation“ is not always possible. Particularly if the building height is low, the air circulation is insufficient. Open windows also encourage intruders. In these cases, motorised fans provide a pleasant climate. Mounted in the roof area, air is extracted (exhaust) or recirculated (recirculating air). Vents in the floor let fresh air flow in again. Good ventilation is important in summer in order to bring fresh, cool air into the room. An air feed in the floor area provides cooling. Windows or air supply units are installed in the skirting. Because air in the glass building warms up and rises, heat can easily accumulate in the ridge area. This can escape through the open rooflight or is exhausted in a controlled manner by ventilation units. In winter, the automatic control is predominantly in charge of using the sun’s energy to heat the glass building. It will only extend the awning or blind once the desired indoor temperature is reached. When temperatures are low outside, windows and vents remain closed to avoid energy losses caused by a cold air supply. Ventilation units with a recirculation function can also be used for heat recovery. 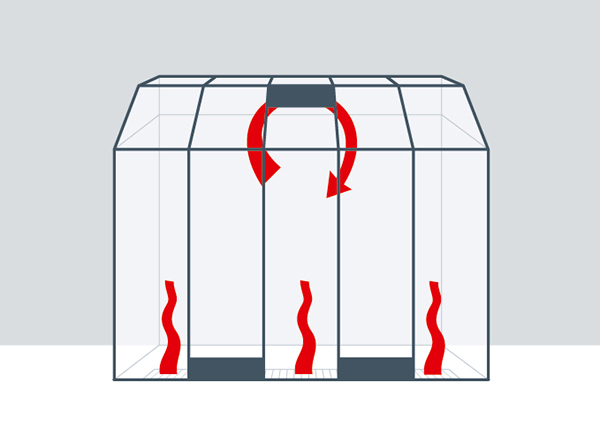 The warm air which collects in the roof area is distributed throughout the conservatory by the recirculation. The air humidity in living rooms is a crucial factor in whether the climate is perceived as comfortable. Correct ventilation brings the air into motion and routes moisture to the outside. An obvious accompaniment to high humidity in a room is condensation on the window panes. This is particularly common if there are large temperature differences between inside and outside. Air movement helps to disperse this, as it occurs through ventilation, heating or recirculation. Elsner Elektronik ventilation units can counter condensation forming even before it has settled as moisture. A special calculation process in Elsner controls starts the recirculation function even before the window panes are affected. Why are ventilation devices used in winter gardens? Wouldn't windows be sufficient? What are the advantages of motor-driven ventilation? - Find the answers to all these important questions here. It seems obvious to integrate a window for ventilation into the glass construction - and in many cases, this is the best solution. It goes without saying that ventilation should be controlled automatically for large glass surfaces, just like shading. After all, the aim is to keep the room temperature and air quality in the living area perfect 24 hours a day. There are two arguments in favour of ventilation with ventilation devices: Improved safety and reliable air exchange. With regard to safety, open windows are not ideal for many reasons. Firstly, they are a potential entry point for intruders. In comparison, not even small animals have a chance of entering a building in view of the opening size of ventilators. Future winter garden owners should, however, also think of the safety of the structure itself. Roof windows in particular cannot be opened when it is raining, snowing or if there is a strong wind. But then what happens to the quality of the air in the room? Another argument is particularly interesting for people suffering from allergies: It is possible to integrate pollen or insect protection that is completely invisible into a supply air device like the WL-Z by Elsner Elektronik. Supply flow devices such as the WL-Z furthermore do not require a motor to ensure a supply of fresh air, so there are no disadvantages for the supply air from in terms of energy. The second consideration concerns architectural conditions. Natural air movement is often not sufficient in winter gardens that do not exceed a certain height to ensure sufficient air throughput just by opening windows. Occasionally, the rising of air heating up in the room (thermal) is simply too little to sufficiently "push" air from the supply windows on the foundation level to the exhaust air windows in the gables or roof ridge. In such cases, the exchange of air must be controlled by discharging the air via motor ventilators like the WL400 or the WL800. 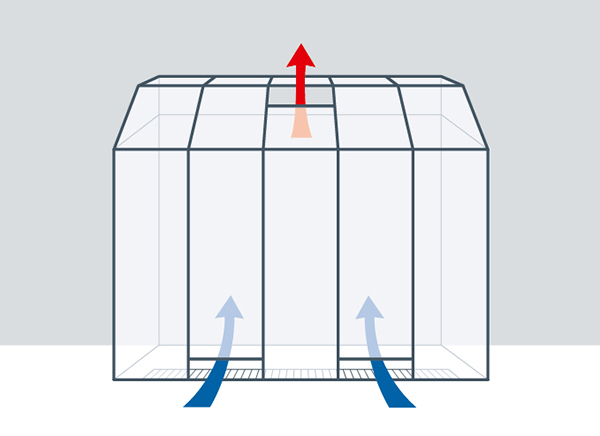 These devices, thanks to their integrated recirculation function, also ensure that condensation on the window glass is reduced and heat is more evenly distributed in the room. What is the function of ventilation in a winter garden, and how should good ventilation be organised? What are the advantages of ventilation devices?